Pretty much everything about the upcoming Google Pixel 3 and Pixel 3 XL has been leaked over the last few weeks in terms of the included hardware. However, on the software front, the leaks haven’t revealed as much. While it’s quite obvious that the Google Pixel 3 and Google Pixel 3 XL will run Android 9.0 Pie out of the box, there isn’t much information about the new Pixel exclusive features that Google might introduce with their release. Now, just a few days ahead of the launch, information about an upcoming more ingrained Google Lens experience have been revealed. According to a recent report from XDA, the upcoming Google Pixel devices will support real-time Google Lens integration within the Google Camera app. The feature was initially referred to as ‘Google Lens suggestion’ and was suggested by a previous leak. The information was leaked by Twitter user IshanAgarwal24 who posted (and later removed) a video on YouTube regarding the same. The GIF above briefly illustrates the feature and shows a simple email address which when brought within the camera viewfinder pops up a prompt giving the user an option to send an email to the ID in the frame. 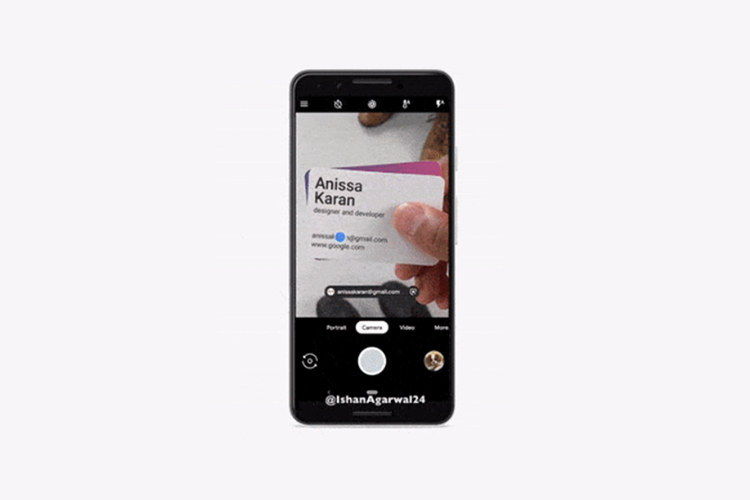 The real-time Google Lens integration looks quite interesting and the fluidity with which it functions might actually get more people to use Google Lens. The feature was allegedly found as part of the ‘Pixel Tips’ app which has been designed to explain all the new software features coming with the Pixel 3/3 XL to new buyers. We believe that the new real-time Google Lens integration within the Google Camera app will be extremely more handy compared to the way in which Google Lens works currently and as long as it doesn’t interfere with the user’s camera experience it should be a welcome addition.